With the growth of industrialization, the heat dissipated has also increased, there are very few industries which recycle the heat but the maximum heat generated is wasted. The process of converting Waste heat to electricity involves less fuel to produce the required energy output. This process of conversion avoids transmission and distribution losses that occur while electricity runs over power lines. It decreases the impact of outages when the power grid shuts down. Waste heat recovery is a process of collecting waste heat and using it elsewhere for a desired purpose. 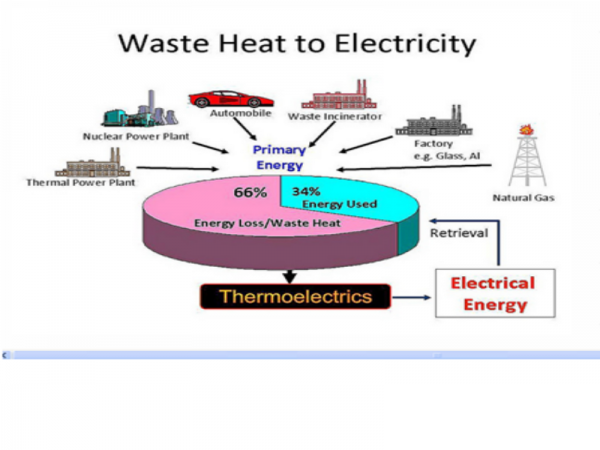 Thermo electricity :To overcome this scientists has developed an environmental friendly technology called thermo electricity, which has the capacity to convert the waste heat to electricity. The thermo-electric devices are self started, they also need no moving parts and are easy to manufacture and maintain. A professional electrician would tell you more about the thermo-electricity process. Utilization: Waste heat can be utilized in many ways, for example; Energy harvested from cars and industrial waste by coating its exhaust pipes with a thin film which is a millionth part of an inch. Quantum physics is also used in the processing of waste heat. Waste heat recovery employs no machinery, it is done by sandwiching a rubber polymer between two metals which acts as an electrode. New Approach: The Scientists of Massachusetts Institute of Technology (MIT) and Stanford University has come up with a new development of a new battery technology that captures waste heat and converts it into electricity. The new approach is an alternative for low-temperature waste-heat conversion into electricity when the temperature difference is less than 100 degrees, works on the phenomenon called the thermogalvanic effect. This system is efficient to even harness the temperature change of 50 degrees. Temperatures of discharging and the chargeable voltage cycle is combined in this theory , where discharge voltage is kept high to charge voltage. The uncharged battery is heated by the waste heat. At higher temperature when the battery is fully charged , it is allowed to cool. After cooling the charged battery gives more energy than with high temperature. Though this system is efficient in energy conversion but the power density is low. Organic Rankine cycle: This process has gained popularity for it applications and is used by many companies like Ormat, Arizzo and many more. Organic rankine cycle is a process where organic substance is used as medium of working instead of water. The main advantage of this process is that it can utilize lower temperatures for the generation of electricity, which was not possible with the water steam cycle. Organic rankine cycle process needs no operators, environment friendly and starts/stops instantly, Low maintenance than a water steam turbine , simple and reliable method with longer life span. Emergency Electrician will set up the process and recommends the organic rankine cycle method for efficient conversion of waste heat to electricity. How Can Industrial Companies Protect The Environment?